Take only one wallet on your adventures. With lifeproof construction, practical features and subtle styling, keep your phone and adventure essentials totally protected in style. We're launching this product on Kickstarter. Back the project now to get it at a great price before it goes on general sale. When packing for multi-day adventures or longer day trips, efficiency is everything. You’ll want to be taking the basics; phone, keys, cards and cash plus any other essentials. Do you take your existing wallet? What about a separate phone case? What if there was a simple solution that allowed you to carry everything and still look stylish for the mid/post adventure pub or café stop? Introducing the Adventure Wallet, designed to help you fit more in. Equally at home on the bike, in the backpack, in the mountains, on the beach or on the table. When you’re doing more than one type of adventure, take something that has you covered for all. With multiple pockets, the adventure wallet allows you to carry your phone, protected and safe from the other items you’re carrying. Our 100% waterproof phone pocket keeps your phone safe and dry while still allowing use of the phones functions. Use the touchscreen, make calls and take photos all without taking the phone out of the wallet. 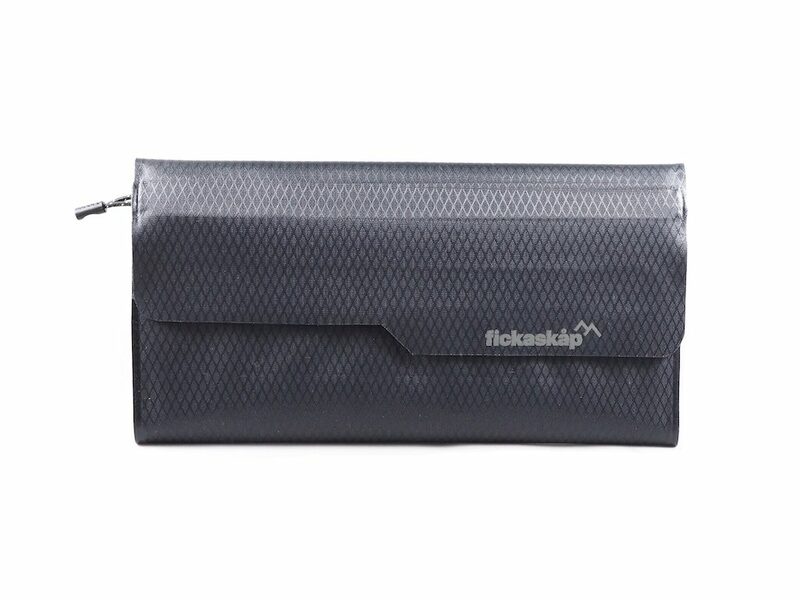 A separate fold out section contains pockets for credit-cards and folding money. An additional weatherproof zipped pocket is ideal for stashing coins or any other loose items. The phone section of our wallet remains watertight* for up to 30 minutes at a depth of 1m (3.3 feet). If the wallet gets dirty, simply wipe it clean or give it a rinse in clean water. The dust proof design means that on the beach or in the desert, our wallet prevents tiny particles of sand, rock or dust from getting inside the phone pocket. The high quality TPU film window allows you to use your phone’s touch screen without the need to take the phone out of the wallet. A separate phone section prevents your phone getting scratched by the other essentials you are carrying. Additional pockets give further carrying capacity options. Available in two sizes to accommodate most phones, both sizes are designed to take up not much more space than the phone itself. We use 100% Nylon with Rip-Stop for the wallet outer. This means the wallet will pick up any scuffs and scrapes instead of your phone and valuables. The press-closure, velcro seal and zipper not only stops anything getting in, it also stops your items falling out. We’ve included internal credit card slots to help keep the wallet organised. A separate weather-proof zipper pocket keeps lose items safe and secure. Our dual sided TPU window allows you to take pictures with both phone cameras, all without taking the phone out of the wallet. Without taking the phone out of the wallet, you can make and receive phone calls with no loss of audio quality. 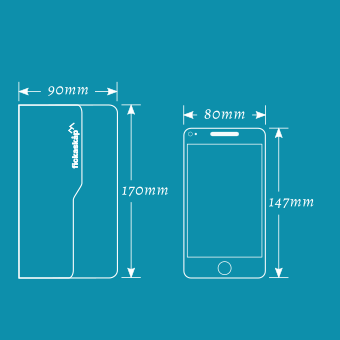 Will fit phones up to 147mm x 80mm (5.8 inches x 3.1 inches) such as Apple iPhone XS, Google Pixel 3 and smaller. 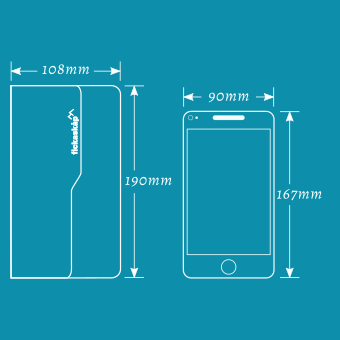 Will fit phones up to 167mm x 90mm (6.6 inches x 3.5 inches) such as Samsung Galaxy S10 and S10+, Apple iPhone XS Max, Google Pixel 3 XL and smaller. All our products are extensively tested by our product development team in all kinds of extreme conditions. So you can rest assured that all of your valuables are kept safe and sound whatever adventure might throw at them. At Fickaskåp we believe that high performance functionality shouldn’t be at the expense of stylish design. All our products are designed with this philosophy in mind. We know that style is as equally important at café stops as it is on mountain tops. Practicality has its place too and you will love the design features that we have included.